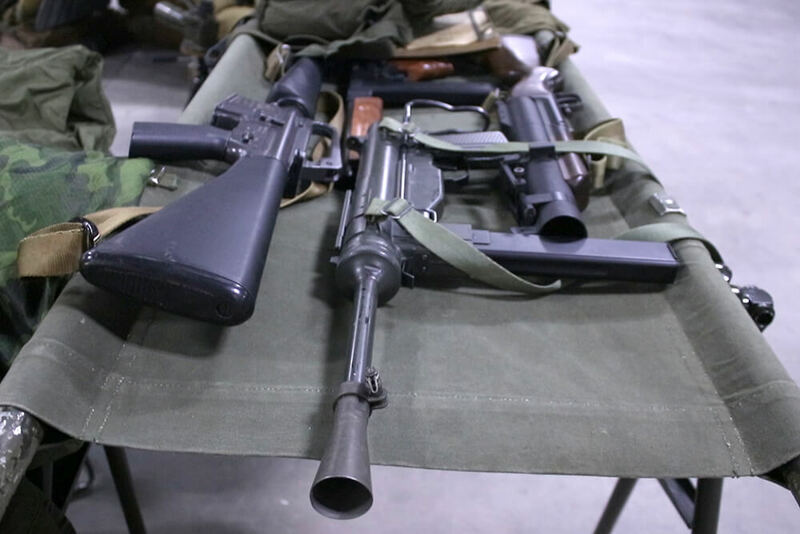 When it comes to clothing, accessories, and weapons for reenacting, authenticity is the name of the game. It’s clear from the outset that reenactors take pride in making sure everything about them is period appropriate, not only in the materials, but also the methods by which everything is made. 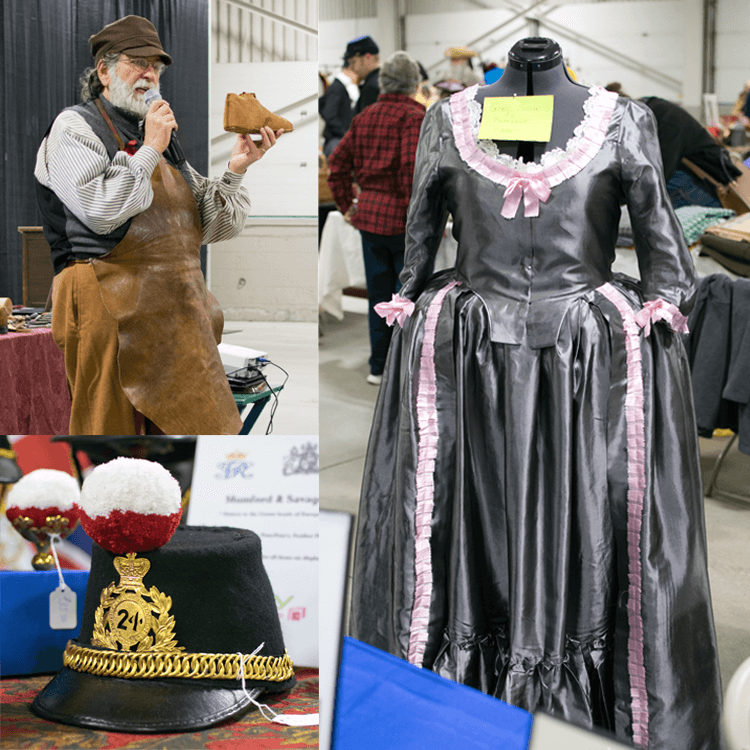 The Northeast Reenactors Fair, held at the Eastern States Exposition in West Springfield, MA (our neck of the woods), attracts reenactors and vendors from all over New England and beyond. You’ll find materials and memorabilia dating from as far back as the roman empire up to WWII and the Vietnam War. We went to this year’s fair, and it was definitely a positive learning experience. The Northeast Reenactors Fair (NERF) started in 2011. This was the first year that the fair was held at the Eastern States Exposition (Big E) in West Springfield, Massachusetts. In previous years it was held in historic Sturbridge village, also in Massachusetts. Increased interest and attendance over the last couple years meant more space needed, hence the move. NERF contributors take pride in providing a diverse collection of products, displays, activities, and lectures to cater to an audience of all ages. Every time period you can think of is represented in some way dating back to the Roman empire. Almost everyone involved including vendors, lecturers, woodworkers, candle makers, and more are dressed for the part. You’ll see plenty of soldiers from the roman legion, the British Army, WWII, and the Vietnam War. Even “civilian” participants dress in period-appropriate attire. There’s a wonderful variety of things to see and buy at each table, and most people behind the tables have a wealth of knowledge on their subject and they’re always happy to share. You can just buy fabric or clothing if that’s what you want, but you can also learn about the fabric, garment construction, and sewing techniques of that time period. If you’re a war memorabilia collector you can buy helmets from different armies, but the seller can also fill you in on what it’s made of, the rank of the original owner, and the meanings of the markings and adornments. If you’re interested in making clothes for reenactments, you’ll find everything you need at this fair. We saw plenty of thread, needles, trim, ribbon, and of course fabric. 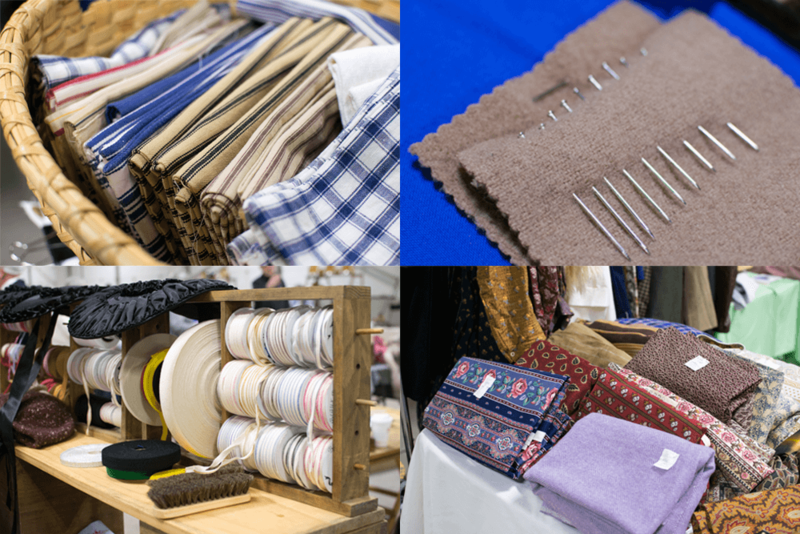 Lots of beautiful fabrics like gingham, calico, broadcloth, linen, upholstery velvet, ticking, taffeta, felt, wool, and more were on display. Wool fabric appeared on products I did expect, like mittens and hats, as well as places I didn’t expect, like actual battle helmets. Each day of the event offers 4 unique lectures by guest speakers from the area. 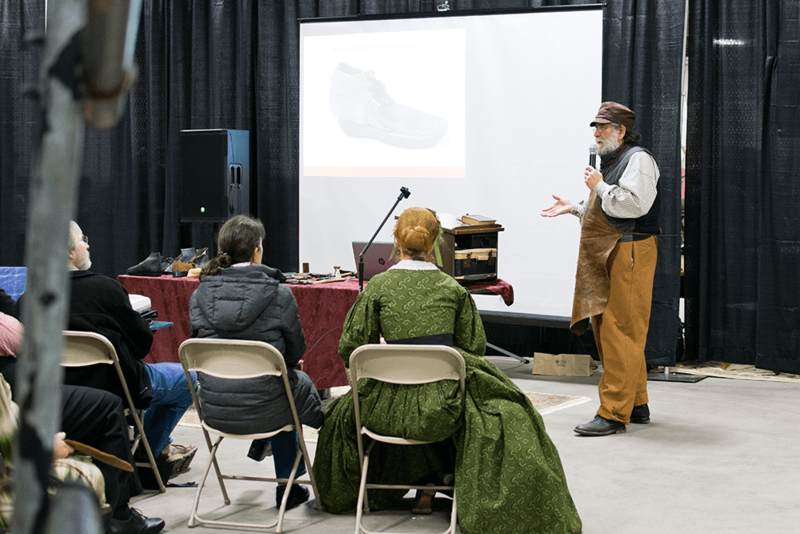 This year’s topics included an overview of the resources provided by the American Antiquarian Society on Worcester, a “living history” performance about Queen Victoria, a Revolutionary War era woodworking lesson, shoe-making materials and techniques of the 17th to 19th centuries, a more practical historical pattern fitting class, and more. I attended the shoe-making techniques and historical pattern fitting lectures. These days most of us take shoes for granted because they’re readily available and relatively inexpensive. This was not always the case. 17th century shoes were handmade, they were often made of a leather top lined with either wool or linen. The soles consisted of a bunch of layers of leather. Square wooden pegs were manually hammered into circular holes on the edge of the bottom of the shoe to hold the layers together. The whole process took 4-10 hours per shoe, and that’s not including a 3 year process of tanning the leather in holes in the ground filled with tanning liquor. Dennis Picard was the lecturer, he brought plenty of knowledge to the table as well as a bevy of photos and examples. Human beings as a species have a continually changing form. This is especially noticeable when looking at historical patterns for women’s clothing. Reenactors often use patterns made from actual dresses that date back to a time when women were shorter, had narrower shoulders, and trained their waist to be smaller using corsets. 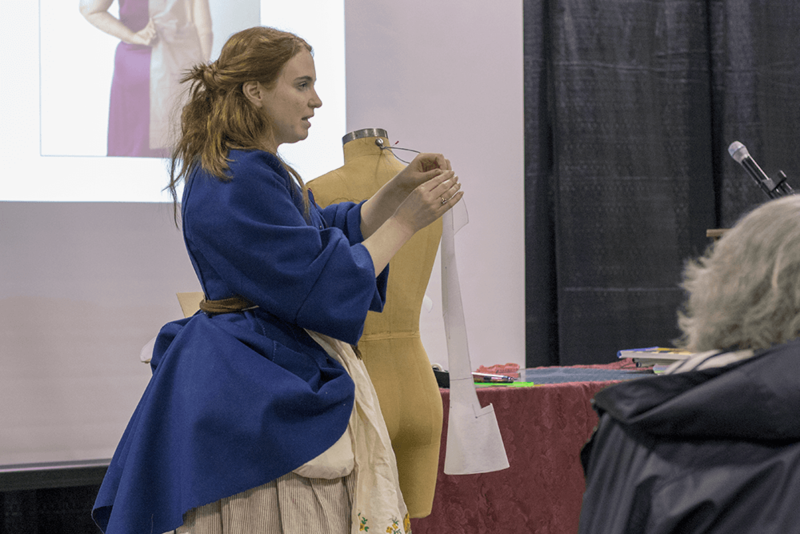 Chelsey Cayer’s lecture demonstrated how to transfer historical patterns on to tissue paper and adjust the pattern pieces to fit modern body types. The informative and practical lesson included a handy worksheet with labeled illustrations. The people involved with the NERF seem optimistic about the future of the fair. Since its inception in 2011, interest and involvement in the event has grown steadily. If you’re interested in reenactments, or even just have a general interest in history, check out the Northeast Reenactor’s Fair next year. You may leave empty handed, but I guarantee you will learn something new.